Today’s Hot Holidays! 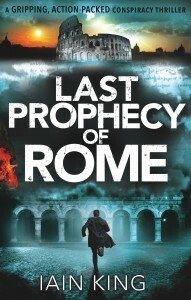 guest is Iain King, whose book the Last Prophecy of Rome is out today! It is a gripping action-packed conspiracy thriller (Myles Munro action thriller series Book 1) featuring an ancient empire; a terrifying threat to the World’s Superpower; and the only man who can stop it. Sounds good? Then listen to the rest…..
ES: Iain, thank you so much for taking the time to talk to us on such an exciting day! Let’s get started by you telling us where you spent your last holiday and why you chose to go there. IK: We went to the wonderful North Bradbury working farm in Devon – it gave my kids, Verity and Myles, the chance to feed the animals and be ‘farmers’ for the week. ES: What’s your favourite type of holiday? 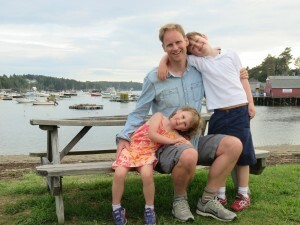 IL: My favourite is either a family holiday, or an adventure holiday somewhere remote and unpredictable. IK: My least favourite is being caged in a resort or chained to a ‘timetable of activities’. IK: I recently travelled to South Sudan, into the jungle near the border with the Central African Republic. Meeting people who farmed small clearings in the rainforest, most of whom had never met a European before, was humbling and exciting. They were the nicest people I’ve ever met. ES: Unfortunately, I do, Iain. On both accounts. Sunburn is nasty. Tell us about a place you long to visit and the reasons why. IK: Either Northern Norway or Antarctica. There’s something magical about the desolate landscapes, and the isolation. IK: I love travelling with local people. You learn so much more from the people than the place itself. ES: That’s very true. Ever had a holiday romance? Details, please! IK: I met my wife when I was working for the United Nations in Kosovo. Kosovo wasn’t exactly a holiday, but we did manage to take weekend breaks from there to Greece, Montenegro and Croatia. IK: I’d spend it meeting villagers in North Korea, and trying to make them laugh. IK: Don’t try to make memories. If you enjoy the moment, the memories will make themselves. Thanks, so much, Iain. Best of luck with the Last Prophecy of Rome!